Quote: "The 'Grand Princess', being headed to Hawaii from San Francisco, experienced a fire in its engine room and lost power about 100 miles from Hilo in the morning of Nov 30, 2015. The crew was able to extinguish the fire just before 8 a.m. and restarted its engine, resuming its voyage after drifting for about an hour." Quote: "The 'Mar da Galega' issued s distress signal on Nov 30, 2015, at 08.43 a.m. due to a fire in the engine room. The vessel with a crew of six, all Spanish except the owner, on board was 15 miles off Peniche. Two fishing vessels, the tug 'Milo' and the lifeboat 'Vigilante' rushed to help. The engine room could be sealed off and the fire fighting system was switched on, but the fire was not extinguished at 1.30 p.m."
Quote: "An empty school bus went up in flames Monday night while it was parked at a lot on Frankstown Boulevard in Homewood." Quote: "A barn was destroyed in an overnight fire in Scott County. Crews battled the blaze along Muddy Ford Road just after 1 a.m. Monday morning. Flames were shooting through the roof of the barn when firefighters arrived on scene. Several tractors and farming equipment were kept inside." Quote: "As they were cleaning up that scene, a second call went out on I-95 near 163 northbound for a dumpster fire, the post states." Quote: "Millions of fish washed up dead in the seaside Ancol, North Jakarta, at dawn. 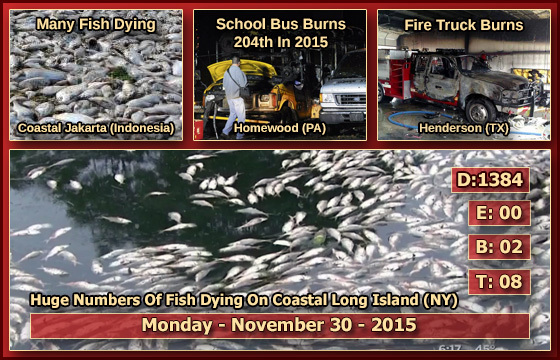 Alleged death of the fish are triggered by pollution of sea water by mud containing hydrogen sulfide or H2S." Quote: "Two infants were found in an apartment and were transported to Reid Health where they both were later pronounced dead. Police said there were no obvious signs of foul play." Quote: "APD identified the man Tuesday afternoon as 41-year-old Brian Gregory Cristan. Officers initially thought the man was struck by a vehicle, but then called the homicide unit to investigate. On Tuesday, however, autopsy results revealed that the body suffered no obvious signs of trauma." Quote: "A body was found floating in the Beira Lake in Fort, Colombo. Police said that the body was found following a tip-off received on Monday morning. They added that a special team was deployed to conduct investigations into the incident. Meanwhile a man’s body was found floating in a lake close to the Nawala Open University." Quote: "Danny Leroy Scott, the 45-year-old driver of the semi, was transported to OSF Holy Family in Monmouth with minor injures, but police say he later passed away from unknown medical complications." Quote: "Firefighters responded to the building collapse at 4835 S. Ashland came in about 3:15 a.m., according to Fire Media Affairs No one was in the two-story building that housed a pawn shop and apartments, but some residents in the area were displaced and warming bus was ordered to the scene, fire officials said." Quote: "Every year the problems are getting worse. We are at the limits. If I may use a strong word I would say that we are at the limits of suicide." Quote: "The state of emergency is for all 77 counties in Oklahoma." Quote: "Researchers from North Carolina State University have discovered a new phase of solid carbon, called Q-carbon, which is distinct from the known phases of graphite and diamond. They have also developed a technique for using Q-carbon to make diamond-related structures at room temperature and at ambient atmospheric pressure in air." Quote: "Q-carbon has some unusual characteristics. For one thing, it is ferromagnetic – which other solid forms of carbon are not. 'We didn't even think that was possible,' Narayan says. In addition, Q-carbon is harder than diamond, and glows when exposed to even low levels of energy." Quote: "A month ago a ward at the hospital had to be evacuated following a fire which had started in a female toilet." 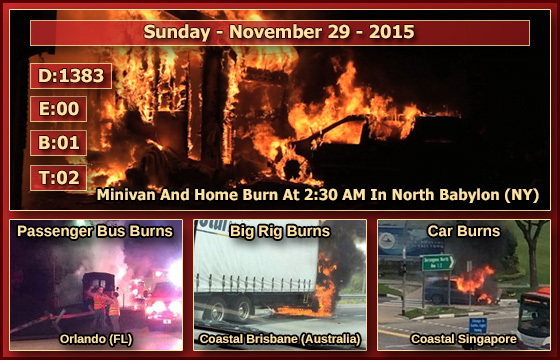 Quote: "Solomons Island, Nov. 29--shortly after 3 p.m. A boat fire was reported in the area of Charles Street. Personnel from Calvert and St. Mary's arrived to find a boat engulfed in flames and quickly extinguished the fire." Quote: "Danny's video comes after it was revealed that fire chiefs had revealed figures that showed cars bursting into flames was becoming more and more common." Quote: "Another five people have died after a gas poisoning incident in east China's Shandong Province on Sunday, bringing the death toll to 10, according to the local government." Quote: "Police found a woman's body in a ditch at the 6200 block of Kirkwood on Sunday morning. The woman, in her mid-20s to early 30s, was fully clothed and was wearing jewelry, none of which appeared to have been stolen. Police said at the scene they did not believe there was foul play." Quote: "Berg was last seen at his residence in St Cloud the evening of November 22nd. Hours later his black Mercury Cougar was found abandoned near Otter Creek Park in Monticello, and articles of clothing thought to belong to Berg were discovered in the park and on the Monticello Country Club golf course." Quote: "The EAIS, which makes up much of Antarctica, has long been regarded by scientists to be much more stable when compared with the smaller, 25 million square kilometre West Antarctic Ice Sheet, which satellite measurements estimated was losing more than 150 cubic kilometres of ice each year." Quote: "By studying rocks at different elevations beside the East Antarctic sheet, the research team concluded that a period of rapid glacier thinning occurred in the recent geological past, and persisted for several centuries. Of particular concern was the potential for 'marine ice sheet instability', where an initial retreat of ice margins into deepening valleys could lead to continued, unstable ice loss." Quote: "If all of it melted, the EAIS would contribute an equivalent of around 50 metres of sea level rise - the vast majority of the total 58 metres that could come from the continent."